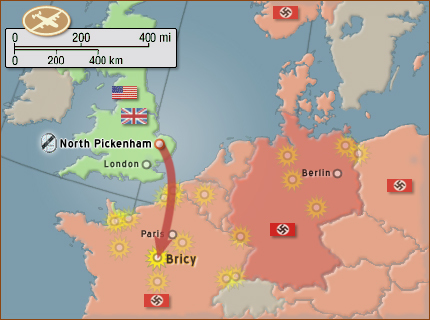 The second B-24 armada for the day was to bomb an airfield at Chateaudun and another near Bricy and Orleans. The Group dispatched 13 planes for the later one under the command of Lt Konstand, pilot of Crew 711. This one was not a Pathfinder mission as visibility was reported to be good there. The Group participated in two missions on this day, both to different airfield targets in France. However, different records contradict each other as to which was mission 22 and which was number 21. We are sticking with the sequence shown here (and on the Mission 21 page) until a compelling reason to do otherwise surfaces. For more details and further explanation, see the "Mission Numbering Controversy" link to the right. Escorts were plentiful and the Luftwaffe was almost gone. If there was any resistance it was light and ineffective. All of the 119 bombers sent out returned without any losses, casualties or reported damages. All thirteen of the Group's ships were able to attack their target. Although there were two missions, none of the crews were able to get in on both of them. If they could had they would have. This mission marked the last 492nd mission for the Davis Crew 704. They had only 6 missions in. Now they were going to train as a Pathfinder crew. That meant on their next 26 missions they could be flyng as a lead ship. A very dangerous position in the Air Corps.